Many good teams struggle mightily with SIEM implementation, which typically takes more than 12 months to start delivering value. Why? Because SIEM is a tool used as part of a larger project: a fully comprehensive security operations center (SOC). Unless you’ve got the SOC building blocks in place, a SIEM is a powerful engine without a car or driver. 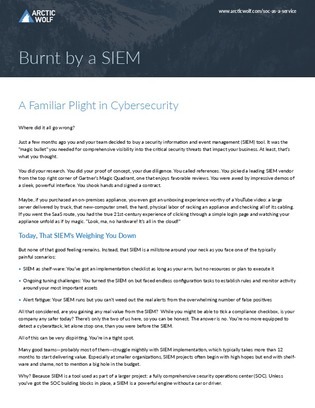 Inside, learn about painful scenarios due to SIEM weighing you down, and find out how a SOC-as-a-service provider can deliver what SIEM alone can't.